Lately I’ve been wondering exactly how many life lessons I have to learn before I’m rewarded. If you compare life to school, we should get payouts every few weeks or so. But unfortunately life isn’t the same as school. Can you imagine paying tuition, attending classes and studying for a final exam without ever receiving a final grade, or worse — a diploma? And yet that’s what life offers us: Endless exams without the benefit of a final review. For some, a lack of final review offers a comforting sigh of relief. But for Capricorns such as myself, it’s like fully stretching a rubber band without ever allowing the Snap! I dated one guy who I would consider an “All American Pie Boy.” His visual presentation stirred mental images of warm apple pies sitting on window sills while young boys play baseball in woolen trousers all across midwestern Americana. Safe, comforting and honest. Unfortunately his outer presentation of honesty and integrity belied his deep-seeded affection for a toxic relationship. Thankfully I wasn’t the toxic relationship – but that in itself was a problem. I spent close to a year watching him implode, addicted to an unstable ex with whom he continually played childish mind and manipulation games like they never left high school. It was exhausting and I thankfully realized after connecting too many dots that he was already spinning a web of lies for me. I cut him loose. I was like the fly that repeatedly smacked against the same spot on the window pane, hoping for better results with each head whack. Giving men multiple chances has been one of the stupidest repeated mistakes in my dating career. Cheaters, liars, alcoholics. The one lesson I’ve learned: What they had no problem doing once, they did again. There’s a reason why phrases like “Zebras don’t change their stripes,” “Leopards don’t change their spots” and “History repeats itself,” exist. If you’ve read “How My Mother Made Me Desperate,” you’ll understand the devaluing of my intelligence by my parents and how it caused me to question all my decisions. This, in turn, caused me to rely heavily on the opinions of the men I dated — alcoholics and all. Thankfully, because of praise from countless teachers and coaches, I was able to grab hold of the glimmer of hope in myself, get therapy, and eventually see that most of the putzes that I dated were even less informed than I was. I realized I replaced my parents with men — or even friends — allowing them to approve of my choices or tell me how to live my life based on the little facts that I was willing to relay. My mother had a way of making me feel like I always had to take any offer that was given. From colleges to jobs to men. And not only did I have to consider the “generous” offer to date, but I also had to consider it may be my only option to wed, as well. I wasn’t taught to go on dates as a casual way of getting to know someone. It was subtly and continuously drilled into me that if I accepted one date, I was locked-in. So if I said yes to the first date, there was already talk by my mother of life integration. There’s a misnomer that ugly men treat women better because they’re so appreciative of having a good woman. Not so. In a futile effort to impress my dysfunctional, negative parents, I gained countless scholastic and athletic awards and accolades. But after years of unsuccessful attempts to impress them — due to the changing tides of their expectations — I was still unable to extract the proper parental love based on my own merits. It was at this point that I gave up and accepted being offered-up like a sacrificial lamb to the (alcoholic) son of my parents’ friends. I was exhausted waiting for the right guy to come along. “At least if he’s not really put-together — no one else will want him and he won’t cheat,” I found myself thinking, not even realizing that he was a serious alcoholic. My thought process focused on my mother’s insistence that all men eventually cheat. Pathetic, I’ll admit. But when you’re riding someone else’s train to Crazy Town you don’t really take full inventory of the passengers. And so I wed.
Four years later I left him, ala Sleeping With the Enemy style. And to this day I feel like I was never a bride, never married and never lived through a honeymoon phase. What I did live through was toxic and terrifying, but without it I would never have awoken to a few much-needed, life altering revelations. This is by far the most difficult thing I’ve discovered in the last few years, and I’m hoping that it was only because of how I introduced my history into relationships that sent the good guys running. I’ve known many good guys in my life. I’ve been in love with them and they loved me. But at those times, because of the mental torment from my parents, I couldn’t handle dating. I’d either retreat completely or reveal too much too soon, thereby overloading them with grisly facts about my home life. They couldn’t handle it because they had never been exposed to that type of dysfunction. Total overload. In contrast, psychopaths had no problem hearing the dysfunctional details of my life and sometimes even attempted to extend an honest hand of help. Unfortunately their own demons eventually surfaced and we’d always be left in a proverbial “Who’s Life Is Worse” match. To this day I’m not sure where that leaves me — other than that I need to be friends with someone before dating. But at least I’m now aware. Alcoholics. Thieves. Druggies. Cheaters. Thankfully after years of praying and practice I’ve gotten better at accepting the things I can not change, changing the things I can, and recognizing the difference. Ironically most of my bad decisions were second-guesses brought on by parental pre-conditioning. The good decisions? I’m finally starting to roll around in those — beginning with the choice to leave my alcoholic husband without telling my mother of the plan. After years of being taught that I couldn’t make a correct decision on my own, I started to believe that I couldn’t date on my own as well. And it opened the floodgates for both solicited and unsolicited advice in relationships. Only I knew all the details of situations, but I continually asked for advice from friends. This changed drastically the moment I decided to cut my mother from The Evacuation plans. It was the best decision I ever made. I’ve dated everything from suits to surfers. It took a few years to realize I leaned more toward the “suit who wouldn’t mind surfing,” type of guy, but before that ever happened I was testing the waters in all things coastal. It’s funny what can happen after graduating college. I went from being well-known in a school of 16 thousand students to a small group of my friends. And because of their new careers and availabilities — and my unwillingness to venture out alone — the pool of potential boyfriends dried up like a maple leaf on a sunny fall day. Enter one dorky surf guy looking for direction and you’ve entered my alternate dating universe. It was only after we broke up and he kept giving me pitiful looks that I realized I never really wanted to marry the guy anyway. We were ridiculously incompatible. He had no direction, no backbone nor the mental capacity to earn himself either one. I didn’t realize I needed more of a suit — not someone who folds under pressure like a wet Baja Hoodie. You’d think the major incompatibilities I found in this one fried fellow would deter me from a few more years of aimlessly dating in the wrong genre, but it didn’t. With my mother constantly introducing me as “The last one left [to get married],” and subtly devaluing my personal accomplishments, it’s no wonder I was ready to form a lifelong partnership with just about anyone remotely tolerable. But dating someone who’s incompatible is like trying to blend oil and water. Only after disowning my mother and starting a year free from dating did I finally accept that dating is just a way to get to know someone, and if you find yourself incompatible, you can go your separate ways. And most importantly — it’s not an absolutely mandatory part of life. “You can’t save everyone,” I’ve been told multiple times. I’ve witnessed countless men (and women) try to please dysfunctional partners and in the end they always — always — breakup. Whether it takes a few weeks or the couple is able to drag it out to 20 years. Because no one tried to save me from the toxic relationship with my mother, I feel compelled to help men who had toxic relationships with their ex. I literally thought if they had a good love, it would turn on a light and they’d not only realize, but be strong enough to save themselves. Ridiculous. They don’t want to be saved. I’m floored by the countless excuses men make in order to stay with someone who’s destroying both their physical and mental health. And what makes it more difficult for me is knowing that their future guarantees one of two things: the end of their relationship anyway, or the end of their life. Instead of seeking happiness, love, peace and partnership, they’re willing to go to the grave in misery. These men literally do not want to be happy because they choose suffering over love. You can’t save a masochist. I’ve lived at both ends of this spectrum and can attest to how good a relationship can be if both people continually work to keep the relationship a partnership. And yes, this does incorporate respect. Someone who “allows” you to do something isn’t respecting you just as you’re not garnering respect by constantly seeking someone’s authoritative approval. If he can’t pull it out for you during the honeymoon phase (no pun intended!) then the relationship is not worth keeping. 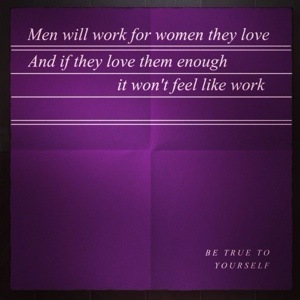 Men will work for women they love and if they love them enough it won’t be work. So if you feel like you’re sucking a relationship out of a man (no pun intended!) it’s time to call it quits. How awesome would it be if life was like the Nickleback song, “Saving Me,” but instead of a death ticker floating over your head, it’s a When You’re Lessons Will Start Paying Off ticker? Thank you so much for taking the time out to read it. I can’t wait to read your thoughts. I can’t wait to hear your thoughts. Thanks! I’m curious, being a woman on a journey to be purposely single for one year, would you be interested in checking out an article I wrote about embracing singleness? I would love to know what you think. Let me know if you’d be interested. Thanks again and have a very blessed day! You’re welcome! I really enjoyed your post. I agree, there are definitely some helpful insights that can benefit others. There’s no doubt about that. I can totally relate to what you mean about sticking with what you know to be right and not allowing other people to knock you off course. I recently covered something very similar in a podcast discussing the importance of dating standards and instincts. You’re so right about keeping people out of your business. That’s often more detrimental than beneficial. Yes, men definitely encounter many of the same things. Thanks again for sharing such great insights. Thanks, Jay 🙂 I try to keep it as truthful as possible. Ironically I’m not someone who likes to dissect relationships to this extent, but I was thinking there should be helpful insights for other folks in there somewhere. / I’d say my MVP would be recognizing my good choices and sticking to them. It’s when I allowed other people to infiltrate my good sense did things go off-track. I’ve learned to keep a reign on my own life. And quite honestly it looks trashy letting everyone know my business, so it’s helped in that regard too. / I appreciate you replying because men go through the same things! WOW! That is a great set of lessons. I believe it is so valuable to take time to evaluate past relationships and take away the most beneficial lessons. 2,4, 7 & 9 are all lessons I can relate to. 6 is something that needs to be discussed at length. That’s something I truly believe more women and men need to be made aware of. If you had to be the MVP of all the lessons you’ve learned from your exes, what would it be and why?